Ancient architecture never fails to awe us when it comes to finding essence and meaning behind physical constructions. While most heritage sites in India stand an evidence to that, a few unsung establishments in coastal Karnataka embody that spirit. These establishments are nothing more than pillars at sight, although they constitute just as much historic spirit as the land that holds it strong. 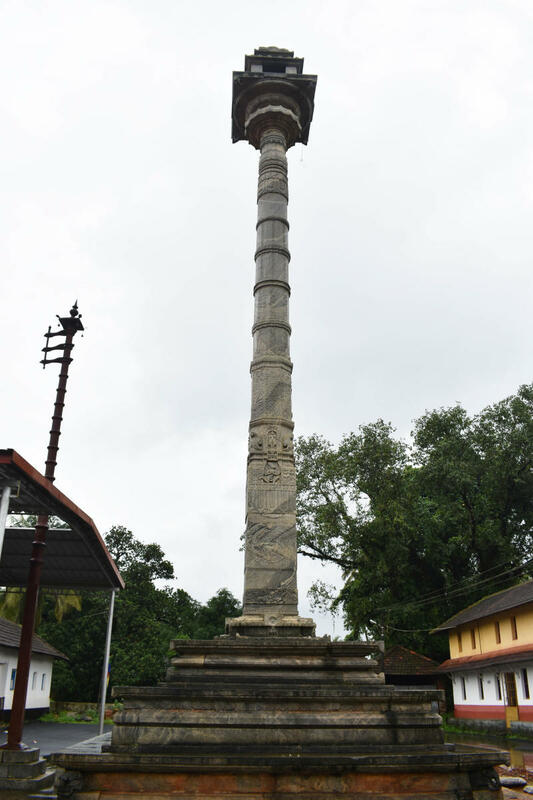 The pillars are known as manasthamba, a typical establishment that one can notice in front of nearly 25 Jain temples in coastal Karnataka. They are constructed as an independent establishment outside the temple, ranging from 30 to 52 feet in height. The height of the manasthamba assimilates the height of the teerthankara statue situated within the temple — usually, the pillars are 12 times the size of the idol within the sanctum sanctorum. The pillars are architectural masterpieces, owing to the gigantic structure and grandeur. The monolithic pillar is placed over a base, which is 6-7 feet in height. 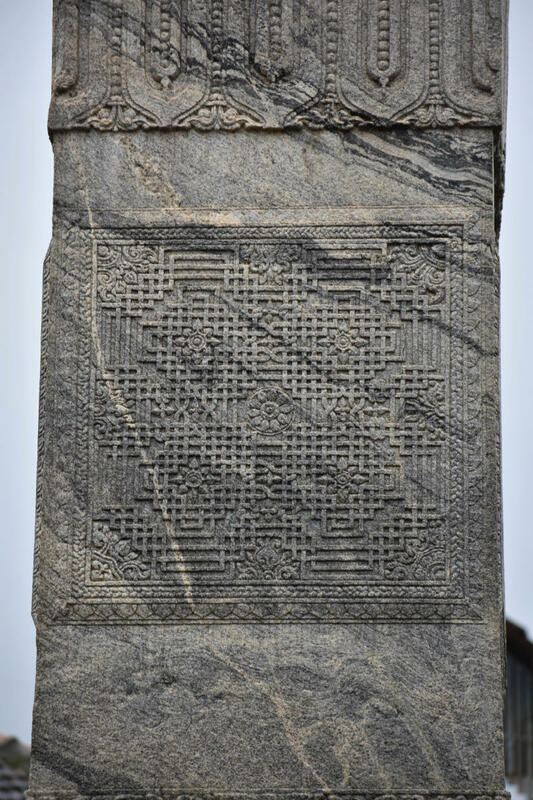 The monolithic pillar is carved in a way that the base forms a square shape, and as it moves upwards, the pillar assumes the shapes of a pentagon, a hexagon and in some cases also a heptagon, sequentially. 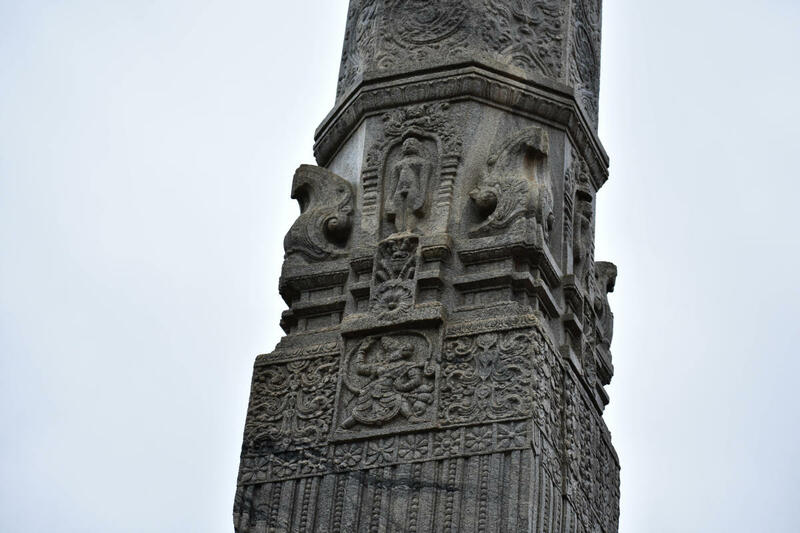 One can notice a number of carvings on the surface of the pillar throughout. 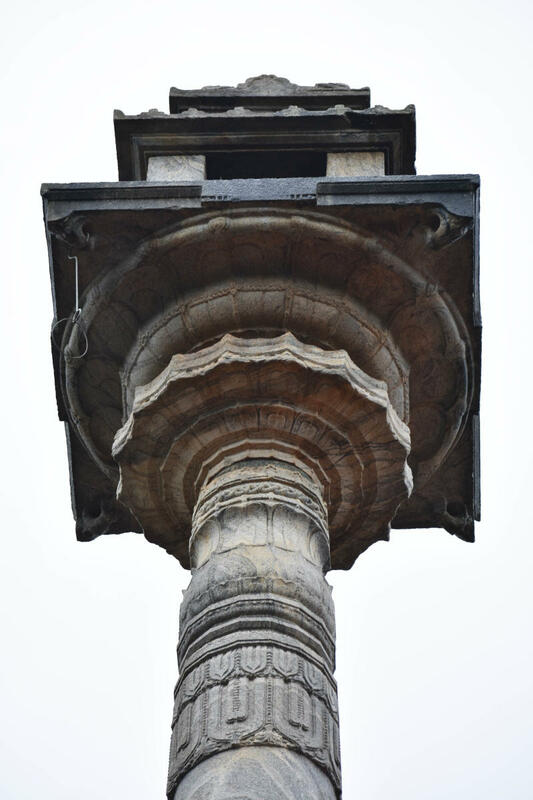 The topmost part of the monolithic pillar resembles the shikkara of the sanctum sanctorum; with an open space over a floral base that houses Digambara statues facing four directions. The tradition of constructing manasthambas in front of Jain temples dates back to the period of Ganga and Rashtrakuta dynasties. Almost all the stone pillars of this sort are established between the 12th and 15th centuries. The manasthamba at the Hiriyangadi temple is the tallest and the most glorious of all, standing at a height of 52.5 feet, since 1522. 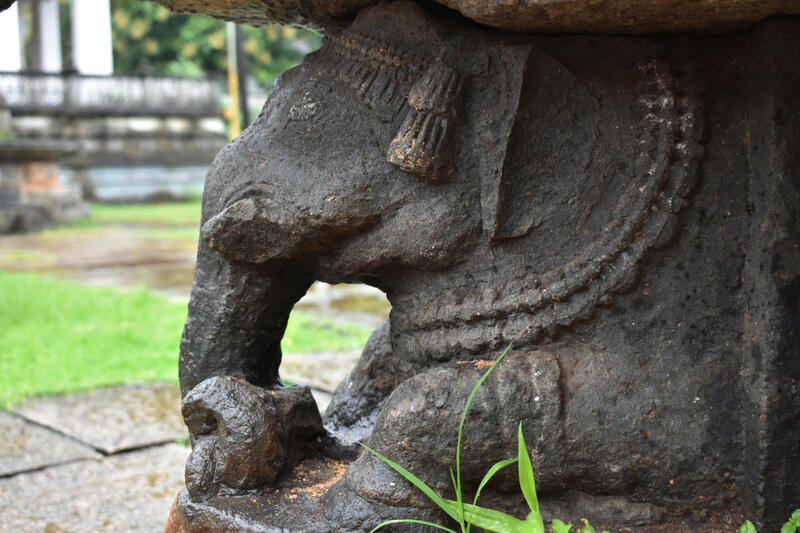 Others include the manasthamba at Aladangady Parshwanath Temple built during the 14th century, one at Mulki, Ananthanatha temple built in 1452 and the other at Varanga, Neminatha temple built during the 12th century, besides others. While manasthambas hold enormous architectural value; it is said that the purpose behind constructing them was purely religious. Their construction is based on the ‘samavasarana’, a concept where all have an opportunity to acquire wisdom. The pavilion is a sign that draws people to have a shared understanding of Jain teachings as well as detaches violence or greed from their lives. Ironically, ancient artisans created these majestic structures that serve the purpose of suppressing their own sense of unreasonable ego. Without these structures, the religious ambience is incomplete at Jain temples. 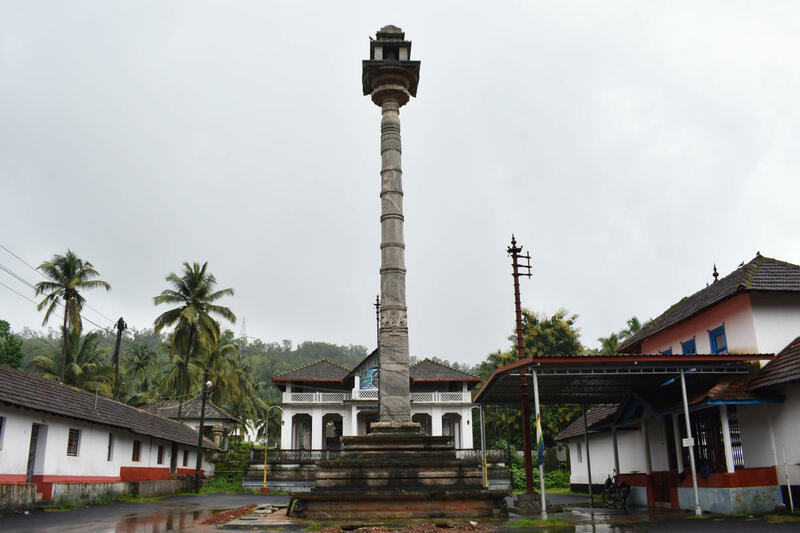 Though these structures are predominantly noticeable in coastal Karnataka, the rest of the state does house them in Jain temples with the same ideology, though not always with the same importance. One of the most prominent and oldest of manasthambas in the state is found in the Panchakuta Jain Temple near Shravanabelagola, which is documented to have been commissioned by Chavundaraya. 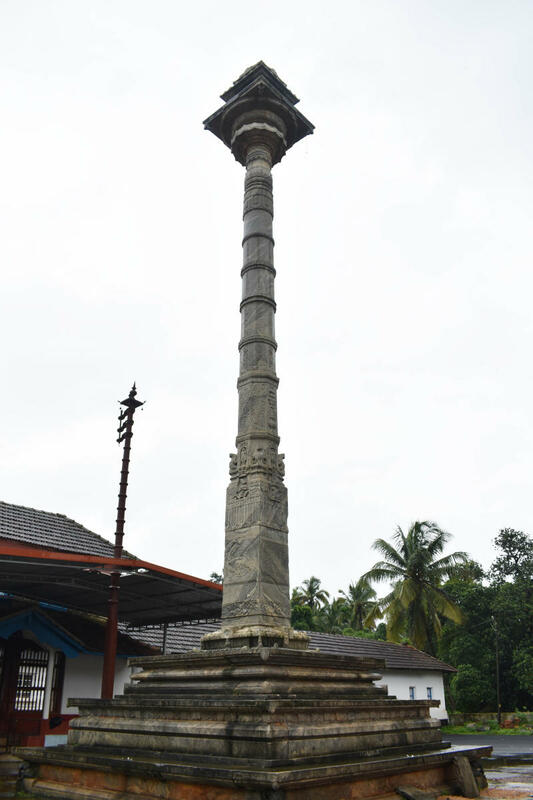 Jain temples with these structures have not only served a religious mandate but also an added attraction but until lately they are a distinguishing feature of Jain temples in coastal Karnataka. Although recently, most Jain temples in the state have comprehended the norm and have established the structure.